Child support is defined as the long-term payments one parent makes to another for childcare costs. Unlike alimony, it is almost entirely based on an objective mathematical calculation. There is little wiggle room. Also, unlike alimony, the duration doesn’t depend on the marriage’s length. Instead, it is based on the ages of the children. 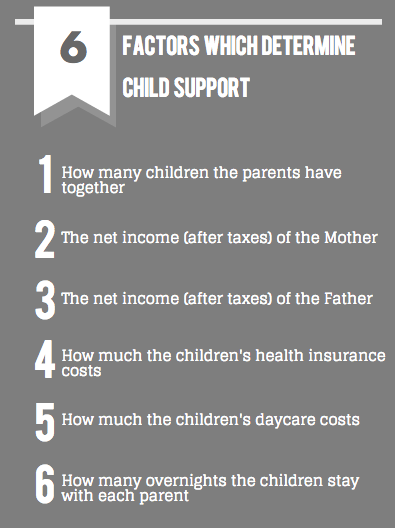 The following are the six factors which determine child support. If you’d like to get a basic idea on costs, click here for a free online calculator. We do not recommend relying on only online advice for this, however. If you have any questions or are confused, contact us here. These numbers will be plugged into a mathematical formula. This will determine the final child support payment. While the value can be changed, typically payments stay the same. They last until the child turns 18 or goes to college, whichever is last. The final difference between child support and alimony is that child support is not taxable. Alimony is taxable income to the recipient and is deductible for the payer. Note: If you’re looking to modify your child support payments, gather documents related to your financial information, like your tax returns and pay stubs, as well as documents which show the change in your or your spouse’s financial situation. Next Post Alimony: Who Pays What and for How Long?